Costa Rican history dates back to about 10,000 BC, the pre-Columbian period when indigenous nations settled in fertile valleys and lived in the shadows of active volcanoes. In 1502, Christopher Columbus touched ground in Costa Rica, dubbing the colony a “rich coast” after accepting golden gifts from the natives. But Costa Rica had little gold and its true riches were more basic in nature: volcanic soil in which, as the locals say, even a stick can grow. By the mid-1800s, coffee had taken hold as the country’s most important export. Bananas would be the only challenge to coffee’s reign until the late 20th century, when tourism—and particularly ecotourism—ascended to the throne of Costa Rica’s most important industry. Below is the story of how Costa Rica came to be what it is today. Although indigenous tribes have lived in what is now known as Costa Rica for thousands of years, the country’s pre-Columbian period was perhaps one of the most formative. Evidence of the country’s rich blend of cultures and history is everywhere in Costa Rica, from the priceless relics housed in the museums of San Jose to the dialects of the tribes that still inhabit much of the country. Costa Rica’s pre-Columbian period can be defined as the timespan from when man first inhabited the area to the early 16th century, when renowned explorer Christopher Columbus first came ashore near what is now Puerto Limon, and the subsequent arrival of the first Spanish settlers. Archeological evidence suggests that indigenous tribes inhabited Costa Rica as long ago as 7,000 B.C., and for thousands of years afterward, life was simple. The land was abundant, making agriculture and hunting particularly important to the early tribes. It is thought that as many as 25 separate indigenous groups once lived in Costa Rica, each with their own cultural traditions, customs and belief systems. When Columbus and the Spanish first arrived in the early 1500s, the culture of these groups had diversified, with many distinct artistic styles emerging from the traditions of the tribes. The arrival of the Spanish settlers brought with it cultural influences from Europe, many of which are still evident today, particularly in the architecture of San Jose. 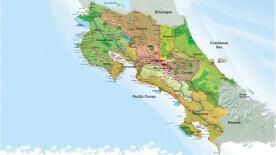 The gradual colonization of Costa Rica also shaped the region politically. The increasing numbers of Spanish settlers complicated matters such as land ownership and provincial borders, which had traditionally been the sovereignty of tribal chiefs known as “caciques,” who wielded their people’s fears of shamanism and other supernatural phenomena to command great power. As the tribes of Costa Rica developed, so too did their artistic and cultural output. Each tribe had a distinct style of craftsmanship, evidenced by the stunning variety of pottery, statuary and other cultural items. Stonemasonry, goldsmithing and metalworking also became much more sophisticated in the years leading up to the arrival of the Spanish in the early 16th century. Each tribe is believed to have specialized in a different aspect of producing not only cultural artifacts, but weapons and agricultural tools. The Chibcha and Diquis tribes, for example, were noted for the quality of their goldsmithing, in addition to their highly refined weaving and textile skills. Some archeologists believe the Chibcha and Diquis were also responsible for the mysterious stone spheres—huge, perfectly spherical boulders that can still be seen today in the Nicoya Peninsula and the Isla del Cano. Some of these large stones measure almost 7 feet in diameter and weigh up to 15 tons. The Corobicís and Nahuatl tribes were also among Costa Rica’s most prolific craftsman. These groups inhabited the valleys of Costa Rica’s central highlands, and this area is home to some of the most important archeological sites in Central America. Most notable are the ruins of their former settlements in Guayabo, approximately 40 miles east of San Jose. Here, dozens of buildings have been unearthed by archeologists and anthropologists seeking to understand more about these fascinating tribes; in addition, evidence of sophisticated water systems such as aqueducts has been discovered at these sites. Today, many of Costa Rica’s indigenous tribes live on. Several of these groups still inhabit their ancestral lands. The Matambú, who came to Costa Rica around 500 A.D., can be found in Guanacaste. The Bribri people still make their home in Limon, while the Cabécar, Costa Rica’s largest indigenous tribe, dwell in the mountains surrounding Cerro Chirripo, and have retained much of their culture and ancestral heritage. Although the arrival of the Spanish heralded a new era in Costa Rican history, evidence of how tribal groups gradually adopted a more modern form of trading has been found all over the country. The Museo del Oro Precolombino, or Pre-Columbian Gold Museum, is one of San Jose’s most popular attractions, and here, visitors can marvel at historical artifacts—some of which are more than 1,500 years old—from this fascinating period. Religious artifacts such as carved idols have been discovered at several archeological sites across the country, some of which date back as far as 500 A.D. In addition to items of great spiritual significance, statues, sacrificial weaponry and even ornate decorative clothing accessories have been unearthed in the past century. While the artifacts housed in this museum are certainly impressive, the process of extracting and working with the gold itself is also noteworthy. Costa Rican tribes worked with alluvial gold, which was obtained by sifting through river silt and the sands of coastal areas with wooden trays. Once the gold had been gathered, it was pressed into geometric shapes before being decorated in a technique known as repoussé, which involved pressing on the back of the piece with a dull tool to create a raised relief design on the item’s front. Few people realize just how intricate and fascinating Costa Rica’s history is, particularly the Pre-Columbian period. With so many cultural influences to explore and such a rich history to discover, Costa Rica is much more than just a tropical paradise. 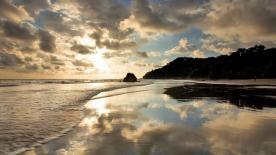 In Spanish, Costa Rica translates to “rich coast,” the name it was given by the first Spanish settlers who arrived in the country in the early years of the 16th century. Thus began the country’s subsequent colonization which is among the most defining events in the nation’s history. 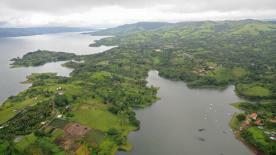 Word of the rich material wealth of Costa Rica soon spread to the Spanish mainland. Believing the country to be an untapped paradise with near-limitless treasures, in 1506 King Ferdinand of Spain ordered a governor, Diego de Nicuesa, to set sail en masse for Costa Rica and colonize the eastern coast. The fleet’s operation was a disaster, however, largely due to the wild, untamed jungles, deadly predators and increasingly resourceful attacks of the native tribes. Despite the gradual colonization of Central America by Spanish conquistadores, it would be almost 50 years before the Spanish successfully colonized Costa Rica. In 1561, the Spanish established their first colony in Costa Rica in the region now known as Cartago. This site was chosen due to the area’s naturally rich volcanic soil, which made it ideal for agricultural development. The small town flourished under the leadership of its governor, Juan Vasquez de Coronado, who employed diplomacy to handle the native tribes of the region. Although de Coronado’s approach to colonization was largely peaceful, skirmishes between the colonists and the native tribes often flared up, and these guerilla attacks proved challenging for the burgeoning communities of the Central Valley. Unlike some other Spanish colonies of the time, Costa Rica posed certain unique challenges, namely the lack of a ready-made workforce of slaves. Fierce resistance to colonization by the country’s native tribes meant the grand, opulent plantations seen in Panama and Nicaragua were largely impractical. As a result, Spanish settlers were often forced to run small, subsistence-based farms. Even the colony’s governor was reportedly forced to plant, till and reap his own crops in 1719 to avoid starvation. Considered a backwater by the Spanish monarchy and surrounding colonies, Costa Rica and its settlers were largely left to their own devices, resulting in the unique blend of Spanish and Central American cultures that is still evident today. Although the Spanish gradually established other settlements outside the Central Valley, the pace of colonization was not nearly as aggressive as in other Spanish colonies. Costa Rica would not cast off the shackles of Spanish rule until 1821. Just four years later, Guanacaste, which was formerly under the jurisdiction of neighboring Nicaragua, was annexed and officially became a part of Costa Rica. Although conflict between the native tribes and Spanish settlers was common and many lives were lost, the cultural influence of Spain endures to this day. Evidence of this can be seen everywhere in this amazing country, including the Roman catholic churches erected during the colonization period which stand proud in the very center of every single town, no matter how small or big it is. What Is the Weather in Costa Rica Like?